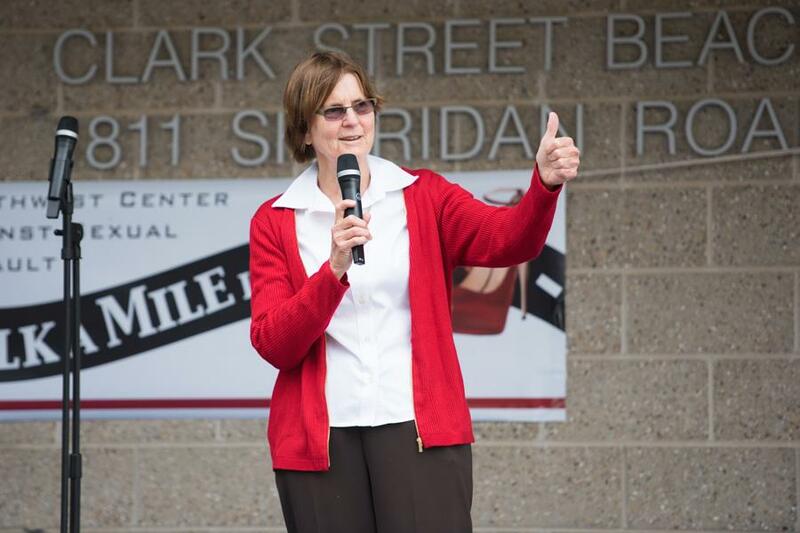 Mayor Elizabeth Tisdahl speaks at an event. Tisdahl and University President Morton Schapiro announced Wednesday the allocation for the second year of the Good Neighbor Fund. The second installment of the Good Neighbor Fund donation will send $1 million from Northwestern to help fund Evanston’s at-risk youth programs and police cameras, among other initiatives. Northwestern is donating $1 million every five years through the fund, which Mayor Elizabeth Tisdahl announced in March of last year. University President Morton Schapiro and Tisdahl jointly agree on how the money should be allocated every year. Tisdahl typically puts together a list of potential allocation ideas, then reviews them with Schapiro, said city manager Wally Bobkiewicz. “The spirit of it is Mayor Tisdahl, President Schapiro sitting down and discussing these issues,” he said. Other funds will go to Evanston Fire Department paramedics, at-risk youth job training programs and two full-time positions at the city’s Youth and Young Adult Division. In addition, $30,000 will fund police safety cameras, which could include body cameras for officers, dashboard cameras or surveillance cameras. An additional $30,000 will go towards a fund at the discretion of the mayor to assist families impacted by violent crime. A portion of violent crime in Evanston is generated by a long-standing family feud or gang issues, Evanston Police Chief Richard Eddington said in April. The fund is used to aid family members who need to quickly leave town after a violent act has occurred, said Bobkiewicz. “When there are acts of violent crime, there are family members who are not involved in the crime who are looking to leave the community because the incident occurred at a place where they’re living or involves family members,” he said. The fund can help the individuals who are in potential danger with the cost of moving their belongings or with gas money or a bus ticket, Bobkiewicz said. “That fund has provided some flexibility to get some people out of harm’s way quickly,” he said. This year’s donation also will include $500,000 to place bike lanes on Sheridan Road, according to a news release. Last year, $500,000 was also allocated to the project. Bike lanes and other improvements on Sheridan are set to be constructed next summer. In a meeting with The Daily on Tuesday, Schapiro said he is concerned installing bike lanes on Sheridan may not automatically the road safer. In plans released by the city last week, the bike lanes will be installed on the east side of Sheridan Road, which will be widened from the intersection of Chicago Avenue and Sheridan Road to Northwestern Place.